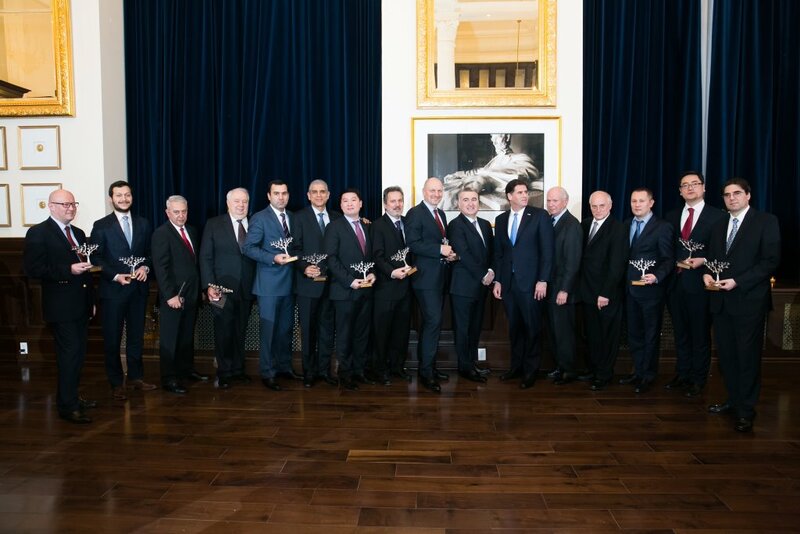 New York, NY, December 15, 2016 …On December 14, 2016 the Conference of Presidents and the Embassy of Azerbaijan co-hosted nearly two hundred guests who filled the room for a reception in Washington, DC to celebrate the upcoming Chanukah holiday and honor those countries and others that provided crucial firefighting personnel and equipment to assist Israel in battling the devastating fires last month. The event was attended by the ambassadors representing the diverse group of nations and others who aided Israel, leaders from many important American Jewish organizations, Ambassador Ron Dermer of Israel and other honored guests, including members of Congress. Joining Ambassador Suleymanov of Azerbaijan were ambassadors and diplomats from Belarus, Bulgaria, Czech Republic, Egypt, Greece, Kazakhstan, Kyrgyz Republic, the PLO, Romania, Russia, Tajikstan and Turkey. The event also followed by one day the visit to Azerbaijan of Prime Minister Netanyahu for meetings with President Ilham Aliyev which resulted in stronger ties between the two countries.